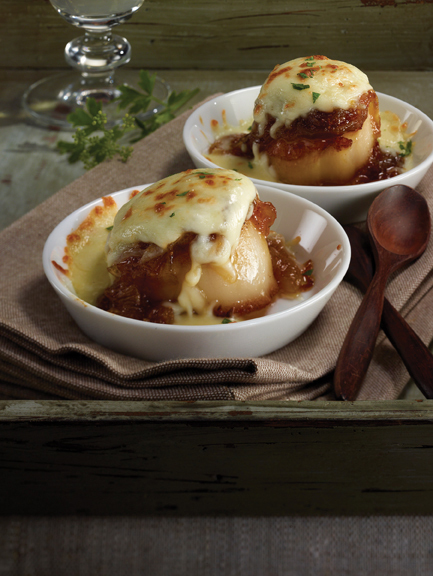 When it comes to comfort foods, nothing quite compares to warm caramelized onions or stretchy melted cheese – and this appetizer has plenty of both. Created by TV host and cookbook author, Sabrina Tutino, these Mozzarellissima Pan-Seared Scallops with Caramelized Onions and Figs are sure to please any palate at your next get-together. More tasty recipes can be found online at www.mozzarellissima.ca. Preheat a non-stick frying pan over high heat. Add a drizzle of olive oil and place the scallops in the pan, ensuring they do not overlap. Sear scallops for a few minutes on each side without moving, until they are a nice golden colour. Remove from pan and set aside. In the same hot pan, add a drizzle of olive oil and toss in onions. Stir well to coat the onions with oil, and add a pinch of salt and pepper. Cook the onions for a few minutes, stirring occasionally until they become soft and dark caramel in colour. If they begin to stick to the pan, add a splash of brandy (or white wine, water or broth) to deglaze and continue cooking. This step can be repeated until the desired colour is obtained. Remove the pan from heat and thoroughly mix in the fig jam with the onions. Place 4 to 6 ramekins on a cookie sheet, placing one scallop in each, topped with 1 tbsp (15 mL) of the onion and fig mixture. Sprinkle with grated Mozzarellissima. Cook for 5 minutes on broil until cheese is melted and slightly golden brown in colour. Garnish with a sprinkle of parsley and serve. - For easier grating, put Mozzarellissima in the freezer for 20 minutes, then grate. - Caramelized onions can also be used to add great flavour to soups, sandwiches or salads.